im going to f'ing kill myself if this noise don't go away. 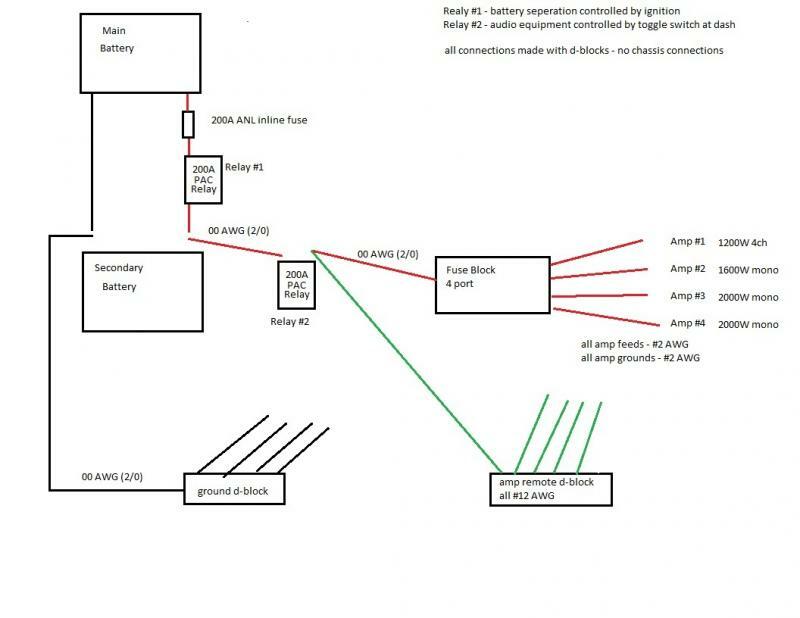 i am attaching a rough drawing of my power system. i need help to resolve noise in system. it is not engine rev, more of a whistle type humming. a time and then all amps - limits my tweets! my power is run outside of cab underneath in pvc flex, my audio is run in pvc flex sepreated from truck wiring along doors. i never had good luck using chassis grounding so i started using all d-blocks and until now never had issues. only hear noise if turned down low or muted. i had same setup in 1998 dodge quad and it was QUIET. muted radio = is it off??? anyone have suggestions that will help or completely remove noise??? Power and signal cable run on the same side of the vehicle? Noise comming from sub or speakers or both? Try elininaiting speaker wires one by one as well. amp 12+ longest is 15"
amp 12- longest is 9"
What model hu do you have? Also, try grounding to bare metal as well see if it helps. Last edited by Sonic; 03-14-2013 at 12:32 AM. I asked about the hu because if it was a pioneer might be the pico fuse problem, but you have a kenwood. By the way some times you get induced noise on the relay that is used for the rem distribution, disconnect the relay and try the rem directly to amp one or two at a time. Last edited by Sonic; 03-14-2013 at 12:42 AM. i have a digital voltmeter with +5/+12 input. i built a small 5v regulator to get display working. i guess i need to filter the regulator now. i do thank you very much for all the help and thoughts.